Product prices and availability are accurate as of 2019-04-18 18:06:09 UTC and are subject to change. Any price and availability information displayed on http://www.amazon.com/ at the time of purchase will apply to the purchase of this product. The HI 2210 is a micro-processor-based pH and temperature bench meter with a glass-body, single-junction, refillable pH electrode and a temperature probe. 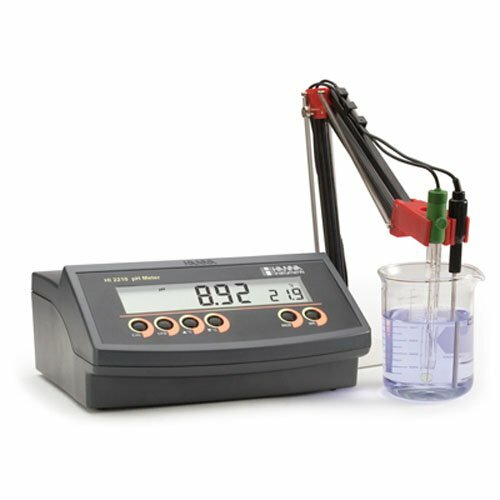 The meter features a large LCD screen, automatic temperature compensation (ATC) with the temperature probe (manual with the pH electrode), and a stability indicator to help prevent inaccurate readings. 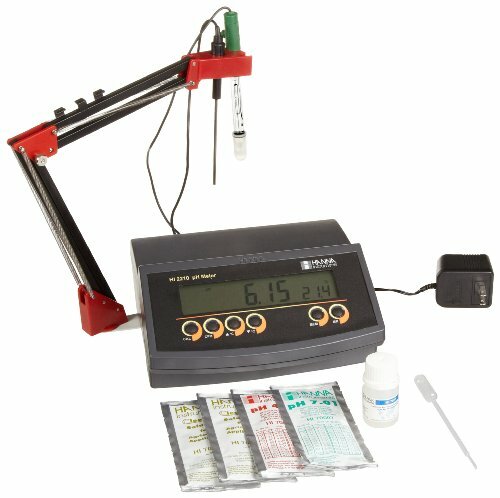 Calibration is automatic at one or two points, and pH 4.01 and 7.01 buffer solutions are included. pH range is -2.00 to 16.00 (+ or - 0.01pH) with a resolution of 0.01 pH. Temperature range is – 9.9 to 120 degrees C + or - 0.5 degrees C (up to 100 degrees C), + or -1 degrees C (outside) with a resolution of 0.1 degrees C. Dimensions are 240 x 182 x 74 mm (9.4 x 7.1 x 2.9") with weight 1.1 Kg (2.5 lb); kit with holder 2.5 Kg (5.5 lb). pH testers measure the acidity or alkalinity of a substance and are commonly used by researchers, manufacturers, and hobbyists. Hanna Instruments manufactures a wide variety of analytical instrumentation, including pH meters, multi-parameter meters, electrodes, chemical reagents and buffer solutions. Founded in 1978, Hanna is headquartered in Woonsocket, RI, with subsidiaries in 32 countries. Hanna Instruments holds many firsts in the field of analytical instrumentation, including the world’s first pH electrode with a built-in temperature sensor, electronic pocket-sized pH tester, and replaceable electrode pH pocket tester. To ensure the quality of its products, Hanna is a vertically integrated manufacturer and does not subcontract any part of its manufacturing.